That's o.k., I didn't want a cow for dinner anyway. No room in the freezer, and I might get sick off all that red meat. If you're thinking of making a call to Linda Hanson and not sure just what to say, the above questions from Laughing Bear are great. To add to them, how about noting that there has been a lot of damage to BLM fences in the area from illegal OHV activities, and ask who is responsible for fixing them and how do we know that they will be fixed? 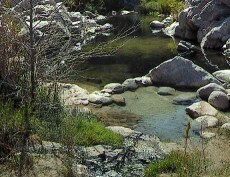 As has been noted recently in Deep Creek Volunteer meetings, caring about and protecting the hot springs also includes concerns with the surrounding area and the uses that impact the area. Don't worry about sounding like an environmentalist if you're not one, do it for the future enjoyment of the hot springs. Everyone, including plant and wildlife species, will benefit.